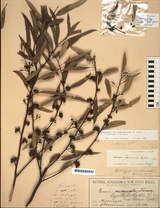 Eucalyptus leptophylla F.Muell. ex Miq. 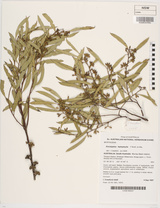 Description: Tree or mallee to 6 m high (occasionally 10); bark smooth or persistent on lower trunk (short stocking only), grey, fibrous-flaky, smooth, glossy, grey or red-brown above, shedding in short ribbons. Adult leaves disjunct, linear or narrow-lanceolate, 5–8 cm long, 0.5–1 cm wide, green, glossy, concolorous. 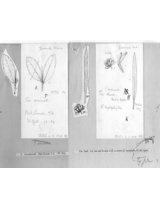 Umbellasters 7–13-flowered; peduncle terete, 6–10 mm long; pedicels terete, 2–4 mm long. Buds fusiform, 4–7 mm long, 2–3 mm diam., scar present; calyptra conical, rounded or obtuse, as long and as wide as hypanthium. Fruit hemispherical or ovoid-truncate, 3–5 mm long, 3–5 mm diam. ; disc depressed or flat; valves exserted with fine tips. 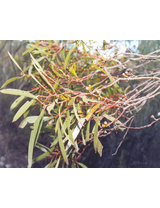 Distribution and occurrence: Locally frequent, in mallee shrubland on red aeolian sands; from south of Wilcannia and west from West Wyalong.